FIRST Robotics Canada announced 27 teams from three provinces will represent some of our nation’s best young minds in science and technology at this week’s FIRST Robotics Competition (FRC) Championship in St. Louis, MO. The Canadian teams join more than 370 from around the globe in a fierce-yet-friendly three-day Frisbee-shooting, pyramid-climbing competition that tests their skills, collaboration and creativity. Students will vie for the opportunity to win more than $16 million in FIRST-specific scholarships to the world’s leading universities in science, technology, engineering and math (STEM), including the University of Toronto, University of Waterloo and MIT. Teams earned invitations at regional competitions; Canadian regional competitions took place in Alberta, Ontario and Quebec over the past few weeks. Canadian FRC regional competitions brought together 121 teams of 25 to 30 students, aged 14 to 18, who designed and built robots in six weeks, guided by volunteer science and technology experts. 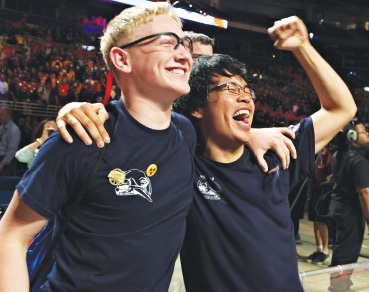 Regional finals are organized by FIRST Robotics Canada, sponsored by BlackBerry® and Hatch, and supported by FedDev Ontario (Southern Ontario) and the Province of Ontario – Ministry of Education. FIRST (For Inspiration and Recognition of Science and Technology) Robotics Canada coordinates friendly competition programs for students aged 6 to18, interested in science and technology, as part of a global network of FIRST organizations. Guided by mentor-experts, students learn how to work as a team, approach issues and discover technology and engineering careers.